Our hardware and software was completely designed by us since 1992. We have hundreds of customers all across the world, whose machines range from CNC machining centers, CNC turning centers, CNC grinders, 5-axis CNC machines etc. Our product has proven itself to be a robust, reliable, and cost-effective retrofit solution. We can tailor and configure a retrofit package to fit your specific machine. The Operator Panel Unit (OPU) consists of a built-in 15″ LCD color display, an MDI input device, Emergency-Stop, Cycle-Start, Feed-Hold pushbuttons, manual pulse generator, etc. The metal case and bottom mouse tray as shown on the picture also included. This make it possible for a retrofit to be done in a few days (while others may take weeks). The whole operator panel unit can be mounted as a pendant station for milling type machines or held by a post for CNC lathes. MS-Tech’s CNC panel is suitable for any types of CNC machine, and it has been installed on machining and turning centers, 5-axis machines, flame-cutter, injection machines, and many more. There is no need for manufacturers or retrofitters to install additional pushbuttons. 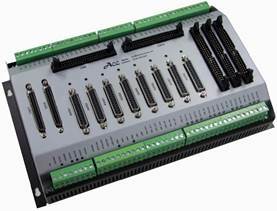 The motion controller unit (MCU) is a highly-reliable industrial computer built with dedicated motion control channels. There are no moving parts inside the controller; it is installed with solid-state hard disk and self-cooling. The power to the controller is 24V DC 2A. The signal connection unit (SCU) is for connecting to and from servo drives, spindle drive, relays, magnetic contactors It also has 14 general purpose isolated input channels and 14 general purpose output channels. The unit is fully shielded by its metal shell. For most machines, there is no need for manufacturers or retrofitters to install any additional relays. 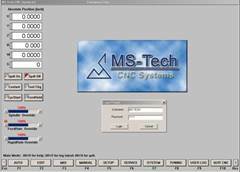 MS-Tech CNC package comes with all you need for most of the machines. Programmable logic control (PLC) is built-in with MS-Tech CNC hardware, and a ladder programming utility is included with MS-Tech CNC Control software. System integrators will find that changing or editing ladder logic is very easy. A set of typical ladder diagrams for your specific machine will be provided with the order of an MS-Tech CNC retrofit package. 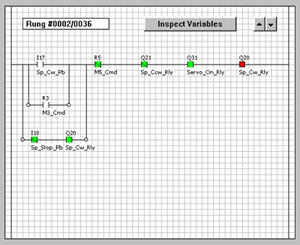 The ladder diagrams can be modified easily with the built-in PLC programming utility. The portable controller is optional. For middle and large size machines, the portable controller offers convenience during machining part setup. Its slim design makes it easy for handheld operations. The portable controller comes with coiled extension cord. For many machines with old Fanuc yellow-cap motors and drives, an encoder-to-tachometer conversion board is needed. Each of the boards on the left can handle 3 servo axes, which makes servo connections with MS-Tech CNC control very easy. 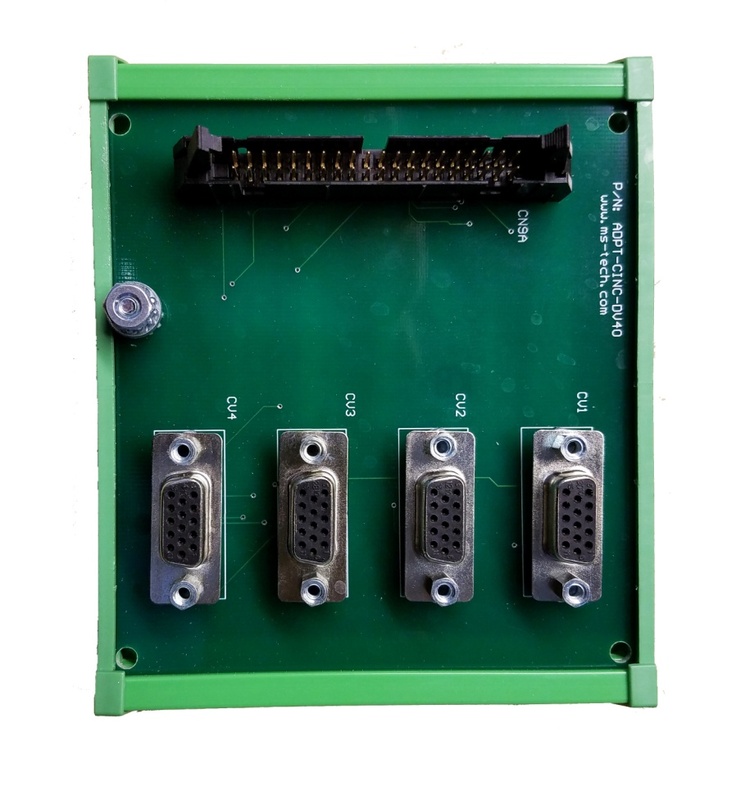 The connection is complete as soon as you unplug the servo drive and encoder feedback connectors from the Fanuc control board and plug them into this MS-Tech control interface board. 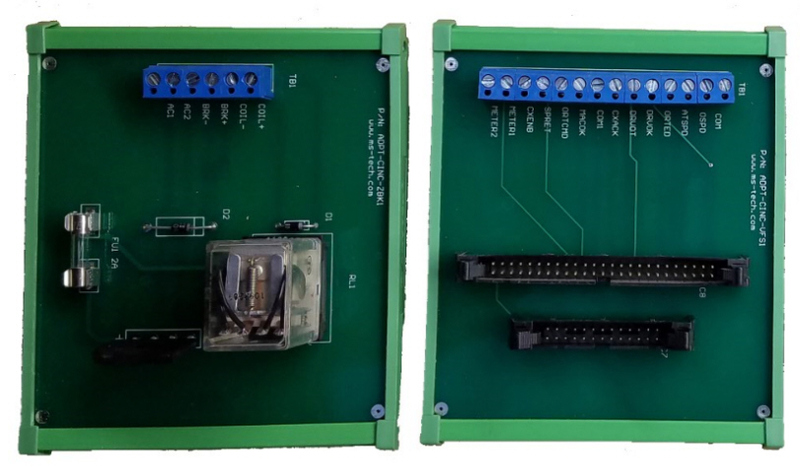 This is an optional board for retrofitting some CNC machines with Fanuc red-cap motors and drives. 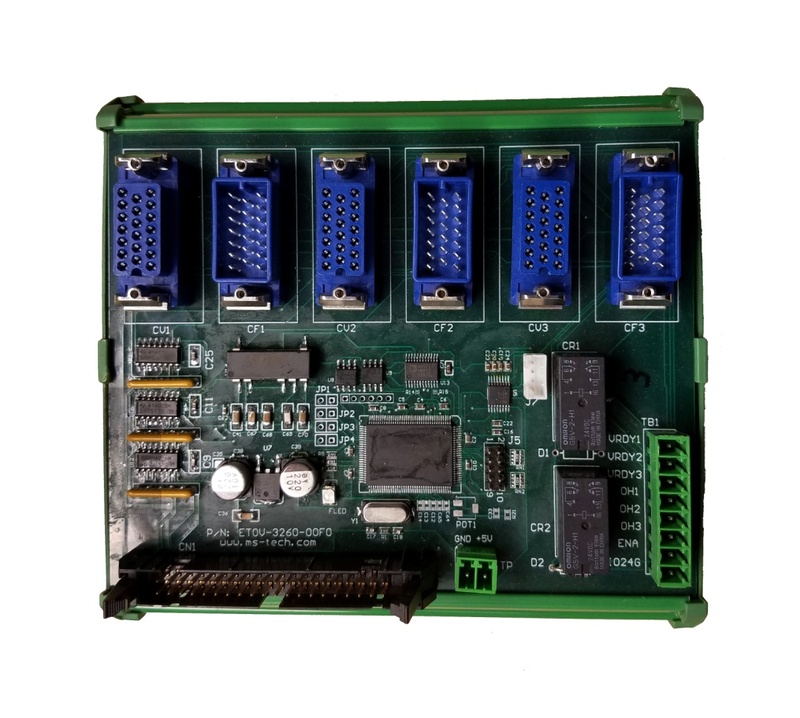 With this interface board shown, the retrofit servo connections are done as soon as you unplug the servo drive and encoder feedback connectors from the Fanuc control board and plug them in into this DIN-mountable MS-Tech board. This is an optional board for retrofitting Cincinnati Arrow-series CNC machines with Kollmorgen servo motors and drives. With this interface board shown, the retrofit servo connections are done as soon as you unplug the servo connectors from the Acramatic control board and plug them into this DIN-mountable MS-Tech board. This is an optional board for retrofitting Cincinnati Arrow-series CNC machines with a Kollmorgen VFS spindle drive. 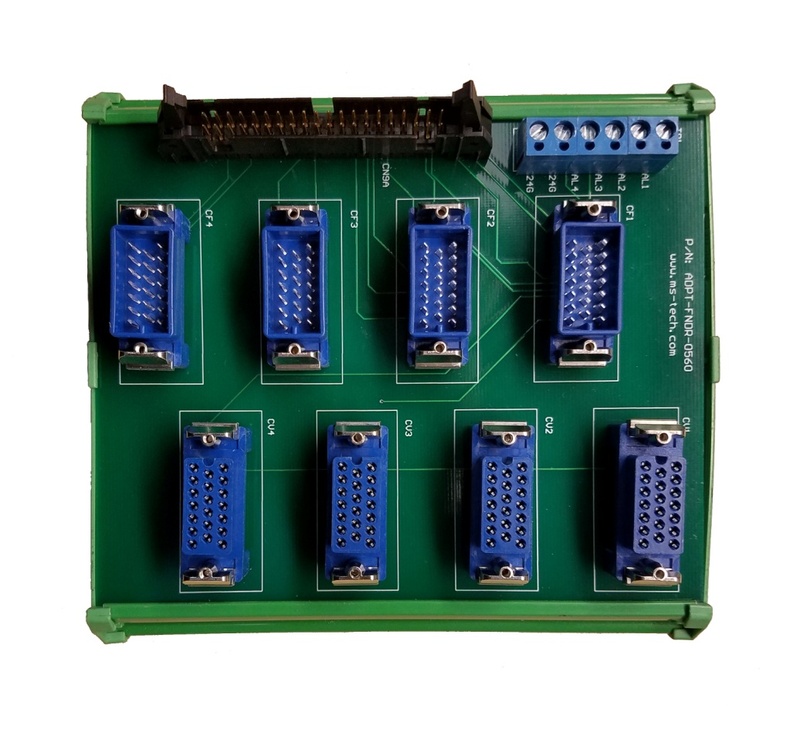 This interface board will save time for retrofit connections. The following core functions are only a portion of MS-Tech’s CNC control’s capabilities. 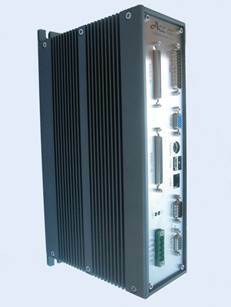 MS-Tech’s CNC system allows for full Fanuc G-Code compatibility. Standard G-code and M-code programming per convention. 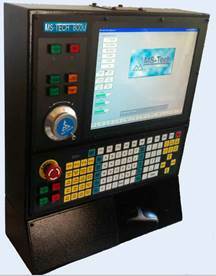 MS-Tech’s CNC Retrofit Package uses a +/- 10V command signal to interface with the machine and uses quadrature encoder signals for feedback. If the machine uses resolver-based signal feedback, then we will provide a resolver-to-encoder conversion board.